Ryan Straschnitzki takes to the ice to practise his sledge hockey skills in Calgary on Aug. 7, 2018. Ryan Straschnitzki spent an hour at his second home Tuesday. 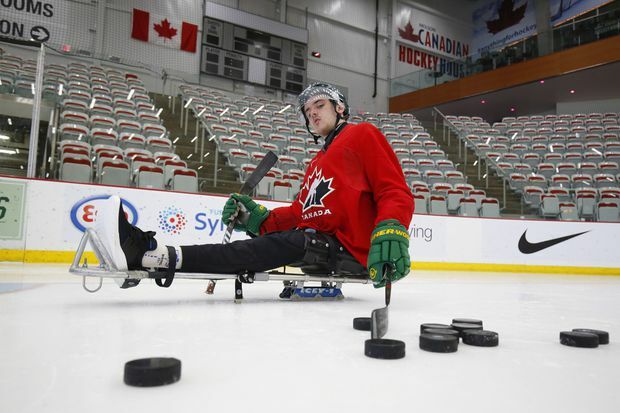 The 19-year-old Albertan, who was paralyzed from the chest down in a bus crash involving the Humboldt Broncos junior hockey team, was practising sledge hockey at the Winsport Centre in Calgary under the watchful eye of former national team member Chris Cederstrand. “It feels like when you’re on the ice you have nothing to worry about so I just like being out here and having fun,” Straschnitzki said. Sixteen people died on April 6 when a bus carrying the Humboldt Broncos to a playoff game collided with a semi-trailer at a rural intersection. Thirteen others, including Straschnitzki, were injured. Cederstrand said combined with Ryan’s work ethic, playing sledge hockey should do wonders for his long-term recovery.